Alexa of Alexa Loves Books and I have teamed up to bring you Table for Two, a collaboration that involves two of our favorite things - New York City and food. The two of us will be highlighting restaurants and dessert spots in New York City. You'll be hearing our personal opinions on the place and the food, as well as where you can go to try it out for yourself. For this month's Table for Two, I'll be chatting about Bibble & Sip and Alexa is featuring Luke's Lobster. Alexa and I have gone to Bibble and Sip twice now and each time, it's been super busy. Which is a good, yet aggravating, sign of how awesome the pastries are. It's a small cafe with hardly any seating so if you want to go, pick a time that isn't after work or on a Saturday afternoon because it's bound to be packed. They offer interesting tea/coffee selections like a lavender latte and a jasmine matcha green tea latte (which we've gotten both times). But they're probably most known for their pastries. Particularly, their cream puffs which are delicious! We've tried the green tea one before but during this most recent visit, they only had the earl grey which was just as good. We also got this mango hazelnut cake that I wanted mostly for how cute it is (luckily it was also very tasty). So if you love going to cute cafes and love sweets, this should be on your list of places to check out. 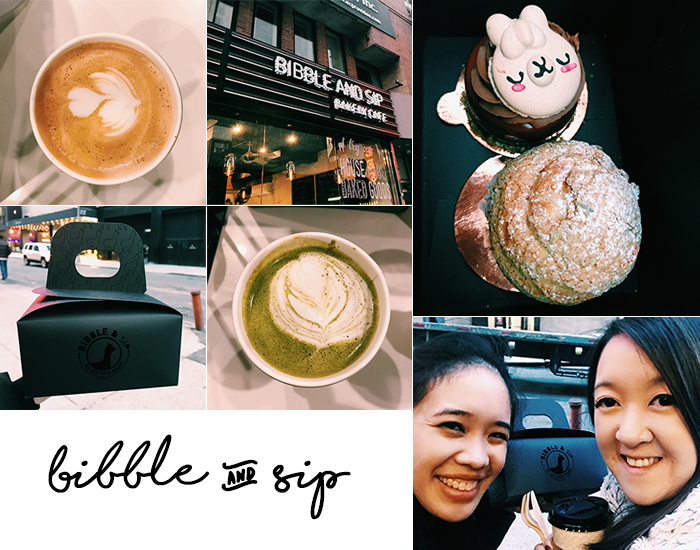 You can find Bibble and Sip on 253 W 51st St. Let us know if you check it out! I love Bibble and Sip! I was fortunate to try it out last year and I will definitely visit it again.